Has there ever been a wholly successful Lear? In the last fifteen or so years I have seen several productions - Oliver Ford Davies, Ian McKellan, Jonathan Pryce, Derek Jacobi, Pete Postlethwaite, but missed the most highly-regarded, Ian Holm's - none of which can be said to rank among the best productions of Shakespeare I've seen. Perhaps it is the play's fault: too extreme, too full, "unplayable", as has often been suggested, dealing as it does, in Jan Kott's words with "this journey, into the existence or non-existence of Heaven and Hell." Except that it isn't particularly baroque in its construction - it doesn't require too much interpretation. Once we accept Cordelia's "nothing", the action unfolds with a rightful logic, albeit in huge bounds. So what were the obvious faults in this production? Despite the best seats in the house, I couldn't hear much of what was being said. This is possibly due to advancing senility, but not entirely. I'd except Stanley Townsend (Kent) and Tom Brooke (Edgar) entirely from the charge. They were excellent throughout. The usually excellent Anna Maxwell Martin was a bit on the shouty side (so not volume so much as enunciation being the problem). Stephen Boxer, whom I saw not so long ago as an aged Hamlet, occasionally became so softly spoken (overcome, I suppose, with the pathos of, well - everything) as to be inaudible. Sam Troughton as Edmund (this is a really high-grade cast) lacked both malevolence and the necessary libidinous allure. But the central fault lay with the great Simon Russell Beale (surely the pre-eminent Shakespearian of the decade). His adoption, in the first half of the play, of a kind of monotonous yet speeded-up dalek-voice, was grating, and there were times when his posture - a kind of limp with shoulders hunched and a continuous scratching of the right buttock - put me in mind of Danny DeVito in 'Romancing the Stone'. The acting wasn't helped by a somewhat incoherent design and direction, mixing realism - cluttered desks and so on - with more abstract sets, which lead in turn to unnecessary confusions. At one point we are in Gloucester's study, which from the entrances and exits of the players would appear to have three doors. And quite where we were supposed to be or when or why was never very clear. Shakespeare is incredibly resilient, thank god. These criticisms apply chiefly to the first half of the production. The play itself works this way, almost as if all the action of the first half is really a set-up for the astounding second. 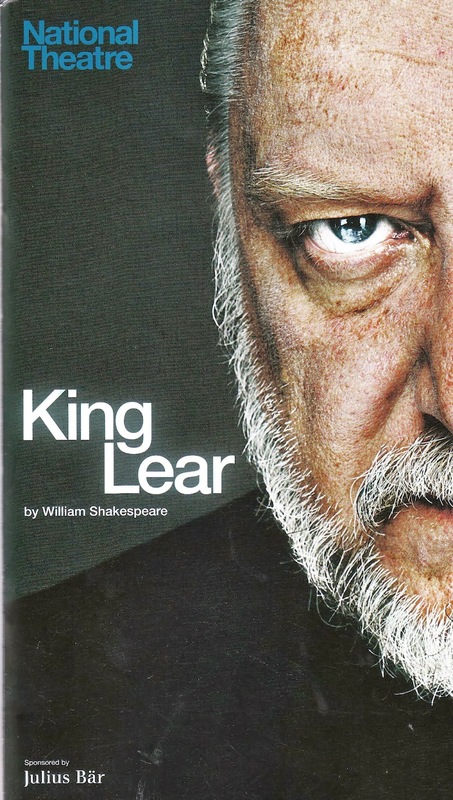 We have moved from the formality of the first scene, through the courts of Goneril and Regan, Lear and his men becoming increasingly unruly, to the heath and the hurricanoes, eventually arriving in a world without kings, where the smell is "of mortality". SRB's matchless ability to play pity and tenderness comes now to the fore and his scenes with both Gloucester ("I know thee well enough; thy name is Gloucester") and Cordelia are as moving as I have ever seen them played. His "she's gone for ever" broke me entirely, as he makes the hairsbreadth pause after 'gone', and turns 'for ever' into the more modern 'forever'. The audience was utterly still and silent in this final scene, early Spring's coughs and splutters caught in held breath. And so a production that had been disappointing at the interval became very nearly a triumph by the end, which is because SRB does understanding better than he does rage (noticeably true, too, of his great Hamlet). Oh, but what a play!